And so this is the second event that we are looking at the past and trying to learn from it. I thought it was good to have somebody who had 13th century codes, but our next speaker has 6th century codes. Besim Hakim is a Fellow of the American Institute of Certified Planners, Member of AIA, an architecture and urban design educator, researcher, and consultant. He studied architecture in the United Kingdom, and urban design at Harvard. He’s been involved in researching traditional codes in the Mediterranean region since 1975, and has published two books and numerous articles on his research findings. He recently completed a research study on codes for the built environment in 19th century northern Nigeria, with publication in late 2003. One of his goals is to recycle the principles and lessons of traditional codes into contemporary and future codes, as an alternative to the current prevalent system. Thank you very much. I’d like to acknowledge the kind invitation from Andres Duany. Since I’m not a member of CNU yet, Andres was kind enough to invite me. I sent him a copy of a recent paper I did, about two months ago. Four weeks later, I got a nice invitation, and praise for the content of the study, and then, of course, Bill Dennis, also for arranging for me to attend and to fit this presentation into a very tight program. Thanks, Bill. What I’m going to do is use some images and discuss a few concepts and ideas while these images are on the wall. This presentation is designed to be very broad, an overview. Because the subject, believe me, is very complex, and certain aspects of it are very detailed, just like the Transect idea, which Andres has presented, has so many pieces to it, and details. So I’m not going to do that; I’m going to give an overview. To give you some references, one of the ideas was to distribute a copy of a later study I did. But you can find it at “Julian of Ascalon’s Treatise” from the 6th century. And for those of you who want to go deeper into the subject, related to the area that is covered by the Islamic world, particularly in North Africa and Spain, prior to the 1500s, you can find this material in my book, titled Arabic-Islamic Cities: Building and Planning Principles, published in 1986. It is now available in a paperback edition. 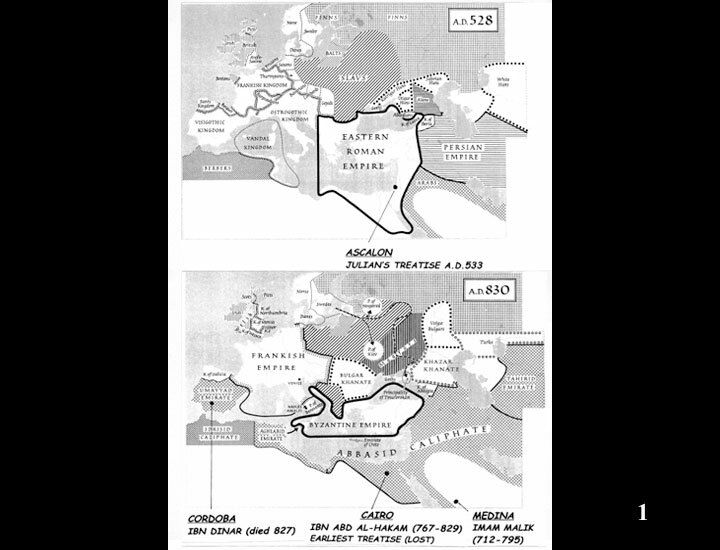 These two maps ( Image 1) —you can see the dates there—the study I did recently is from an architect from the town of Ascalon, who wrote a treatise, dated approximately 533 A.D. This treatise is very important in the history of Byzantine and Greek culture, as far as building codes are concerned. Because it spread to Constantinople and then to rest of the territories of the Byzantine empire. Here, in the lower map, the Islamic spread is right through here, North Africa and most of Spain, in this period. What is important to note here, is that there is a man called Imam Malik(712-795) from Medina in Arabia. His writings are extremely important for the school of law which he founded, the Maliki School of Law, which spread through North Africa, Spain, and sub-Sahara Africa. His School of law is still operational and followed today. He did cover in his texts a number of issues related to building codes and construction matters. Here in Cairo, there is Ibn Abd al-Hakam, who lived in the period shown on the map. His career overlapped with Imam Malik’s; in fact, studied under him. This is the first person who wrote a treatise on construction codes. But his treatise is lost, unfortunately. However, it is heavily cited by later writers. So that’s the first treatise in the Islamic world, written in this time frame of this man’s life. At the same time, there was another treatise written in Cordoba, Spain, the author of which, Ibn Dinar, died in 827 —a contemporary of Ibn Abd al-Hakam. He was another man who wrote on construction matters; again, his treatise is lost, unfortunately, but cited by later people. So, two treatises, written at more or less the same time—and lost. 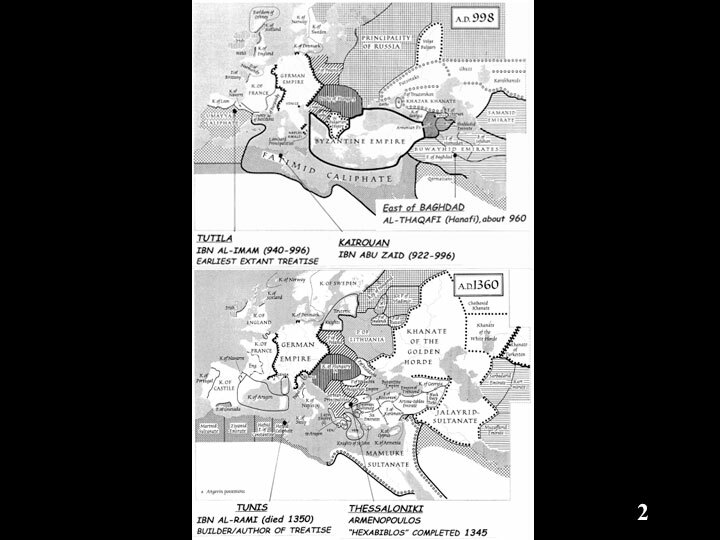 Here, in this period ( Image 2), note territories of the Byzantine Empire, in Kairouan which is now in Tunisia (a town south of Tunis), Ibn Abu Zaid produced a huge study—in volumes; it was recently transcribed and published in 15 volumes. In about a volume and a half, there are complete details of construction and building codes, and matters related to cities. He quotes a great deal from Ibn Abd al-Hakam, who I mentioned in the previous image, and whose treatise is lost. So this material exists now. At the same time, you can see these two individuals whose death dates are the same. Ibn al-Imam wrote a special treatise on building construction in a town called Tutila, which continues to exist, a small town about 50 miles northwest of Zaragoza. It’s called Tudela in Spain. His is the earliest extant treatise that has survived till today. This is a very important treatise. Most of these treatises I’ve talked about so far were written mainly by jurists—people who were specialists in jurisprudence—not builders or architects. Ibn al-Imam’s treatise continued to influence Spanish building law, even till recently, especially in the southern parts of Spain. There’s a recent study by a French scholar, which documents the continuity of the content of this treatise in a Spanish code from 15th century Toledo, and then it also spread through other regions, particularly in southern Spain. Remember the Treatise of Julian of Ascalon: It was integrated in a book called Book of the Eparch during the period of Emperor Leo VI, 886-912 in Constantinople. The Eparch was the governor of that city. So Julian’s treatise on construction from Palestine, was completely integrated into the Book of the Eparch by approximately 900 A.D. In the 14th century, the lower map, two important things occurred as far as treatises are concerned. 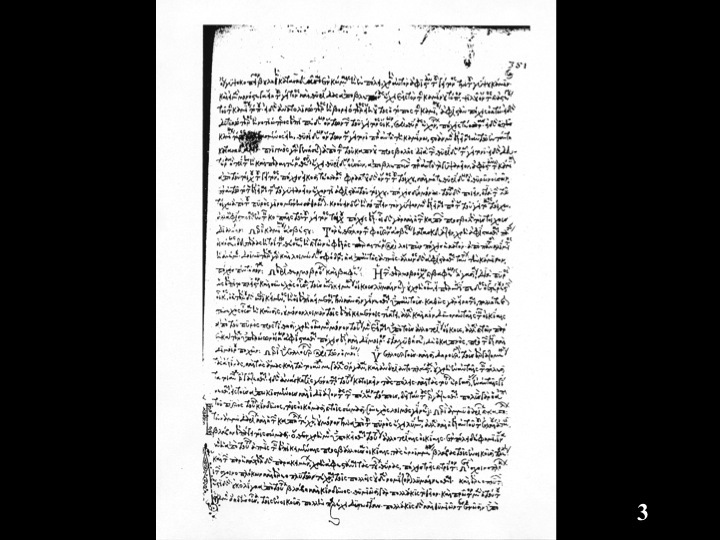 Armenopoulos was a well-known lawyer in the city of Thessaloniki, wrote a huge compendium on civil law, called Hexabiblos, which means “the six books.” His book is dated 1345. And in book two of the six books, he used Julian’s treatise almost verbatim, and added other codes from emperor Zeno, previous to Julian’s time, and some later codes. But primarily, the codes in book two of Hexabiblos are from Julian of Ascalon’s treatise, the architect. In Tunis, at approximately the same time, a master builder by the name of Ibn al-Rami wrote a complete treatise on building construction. He used a lot of the material that I mentioned to you earlier, from those earlier Arabic manuscripts, including Ibn al-Imam’s manuscript. Plus, he included his own experiences and interpretations from being a master builder. So this manuscript, I would say, is the most important one in the Islamic world, as far as rules for building construction are concerned. It is more detailed than Ibn al-Imam’s treatise, which was written in the late 10th century. I have analyzed Ibn al-Rami’s treatise very carefully, including many of its stipulations, in chapter 1 of my book, Arabic-Islamic Cities which I mentioned earlier. Incidentally, an important point: the Hexabiblos, because it was made available in many copies, started to spread its influence to all the areas of the previous Byzantine Empire. Remember, the Byzantine Empire is now a small area at the time of Armenopoulos, but it did spread in all of this region. And particularly in Greece, its influence continued till the late 19th century and well into the 20th century. In fact, in the island of Naxos, in Greece, they found a specific legal document dated 1826 from the local administration, which specifically uses one of Julian of Ascalon’s prescriptions for a problem in construction. And where did that come from? It came from the Hexabiblos. So the longevity of Julian’s treatise, from the 6th century right through the early 20th century, is incredible. But of course, there are problems with the prescriptiveness of its stipulations, which one can discuss. This is a page (Image 3) from the earliest existing copy of Julian’s treatise. Of course, this is Greek, but this Greek is from the 13th century, and I was told that this script cannot be read by contemporary Greeks, but by specialists, and by monks in the peninsula of Mount Athos. So this manuscript is the one I analyzed and documented very carefully, including all its prescriptions, in the published study I mentioned earlier, for which I gave you the Web page. 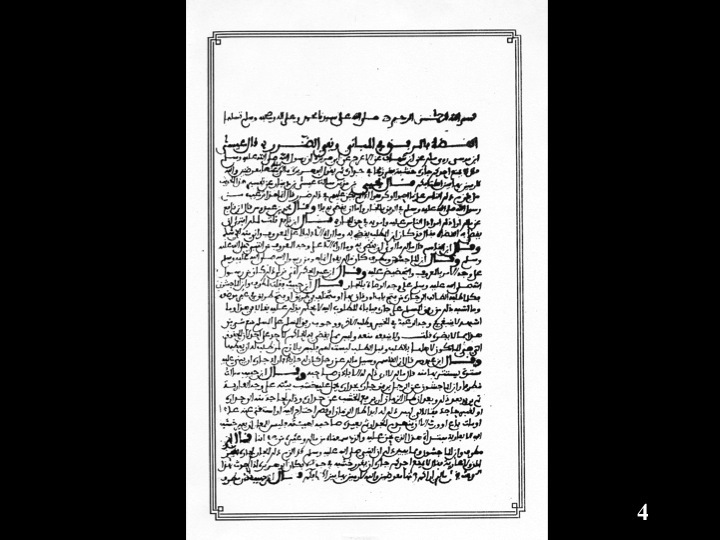 This is (Image 4) Ibn al-Imam’s manuscript from Tudela, in Spain. Four copies have survived. This is a sample page—page one—of one of the surviving copies. This text is readable, but the person who reads it has to be familiar with the script of the western Islamic world. This script is not used in the eastern Islamic world. It was also, of course, used in Spain prior to the 1500s. But the language is very clear. We find that Julian and Ibn al-Imam (he’s the person who wrote the treatise from Tudela in Spain) share similar goals and intentions. The reason is that both manuscripts, or texts, have roots in the practice of the ancient near east. This is a very important point. In other words this type of coding ,or this kind of thinking about the built environment, has very ancient roots that go back to at least 2,000 B.C. in Mesopotamia. The goal is to deal with change in the built environment by ensuring that minimum damage occurs to pre-existing structures and their owners, through stipulating fairness in the distribution of rights and responsibilities among various parties, particularly those who are next to each other. This, ultimately, would ensure the equitable equilibrium—this is a term I coined—of the built environment during the process of change and growth. By equitable equilibrium I mean that you cannot have certain parties in the built environment having more privileges or rights than others. Everybody has to be treated equally. And the purpose of these codes is to ensure that this is maintained through time, through the process of change and growth. As far as certain intentions in the codes, which are common to these is that change should be accepted, and, therefore, you have to deal with it. Especially among proximate neighbors, who could create damages onto one another, and therefore, those damages must be prevented, particularly you do not do something that would debase the social and economic integrity of adjacent properties. And, you should not allow conditions that adversely affect the moral integrity of neighbors. For example, by having a certain use inserted into a neighborhood, which would create moral problems. For example, somebody converts their house into an obnoxious use. You are not allowed to do that. And, uses and activities that destabilize peace and tranquility between neighbors. So these types of damages must be prevented. There is another important consideration: Property owners have the freedom to do whatever they please on their property. This is a very important concept. Within your property you can do whatever you want on it. Most uses are allowed, particularly those for a livelihood, provided the use does not create damages to neighbors and the neighborhood. However, the freedom to act within your property is constrained by pre-existing conditions. Sometimes neighbors have servitude rights, and those have to be respected. And then, of course, the concept of interdependence between adjacent parties due to the compact nature of the built environment in traditional towns. And then, the public realm—mainly streets, of course—their integrity has to be respected, and should not be subjected to damages from the private realm. In comparing these two treatises—Julian’s and Ibn al-Imam’s—we talked about the similarities, but here we find some differences (Image 6). In the case of Ibn al-Imam’s treatise, the concept of the right to abut a neighboring existing structure is paramount. You have the right to abut an existing structure, which Julian does not go into. Also, the question of streets is very much addressed by Ibn al-Imam, but Julian does not talk about streets—unfortunately. His treatise is silent about that. On the question of overlooking and views, this is very interesting. In Islamic societies, the main concern with visual corridors is the question of privacy, that privacy should not be compromised through visual corridors penetrating doors, windows, openings, and from higher areas. Whereas in Greek culture, the whole question of visual corridors is especially important for enjoyment of views. Sometimes however, views or visual corridors create nuisances. But the question of enjoying the views is very important, so there is a cultural difference between the way these two cultures treat visual corridors. Also, in the case of Julian, he addresses a lot of details of construction matters related to multi-story condominiums—up to four stories or more. And he deals with floors: If you owned the top floor and somebody else owns the lower floor, what happens if there’s a problem in the construction, what happens to the roof, what happens to a terrace, if the terrace is used by others—you own the terrace but others want to use it; you can give them the right to use it—what happens if it requires maintenance? So there’s a very interesting portion of Julian’s work here. Two important concepts here (Image 7), both also exist in the Greek culture—when I say Greek I mean primarily post-1500 to 1900. During Ottoman rule a lot of the customary codes and laws began to assert themselves in each locality, rather than being subject to a central authority. Here, we find a very interesting concept, which is also prevalent in Islamic cities, and which is also evident in Greek traditional architecture. The concept of the fina—this is an Arabic word—or harim. This is an invisible area, usually about a meter wide, which—owners of this house, for example, have certain rights to use that area, while others, i.e. strangers, are not allowed to make use of. But at the same time, it doesn’t mean that this person can obstruct the right of way. Same thing here, and so on. But the concept is a very powerful one, because in cross-section, what you find is that it has a vertical component, so that in this area, you can project certain projections, provided you don’t impede a certain height to allow traffic. And then, the concept taken further, actually creates the room bridging the street, which Professor Reps mentioned in French as a pontet. It is called sabat, in Arabic, and the concept is very simple: This is your fina; this is the other fina, but in fact, you might as well—if certain conditions exist—connect the two sides and create an additional overhead structure. In traditional cities—in Greek towns and in Islamic cities in North Africa, especially—you find different conditions for supporting this room bridging the street. And when you see something like this (no columns on either side), usually this means that this room, or this structure, is owned by the same person who owns the structures on both sides of the street. If you find this condition (one column on one side), it means the owner of the Sabat is on the side without the column; This condition (columns on both sides) could be used by either side, for the purpose of making this structure marketable to either side in the future. But what is important is that these columns are not conceived along our modernistic ideas of viewing the column aesthetically, and, therefore, we like to have a space around the column. It didn’t work that way. 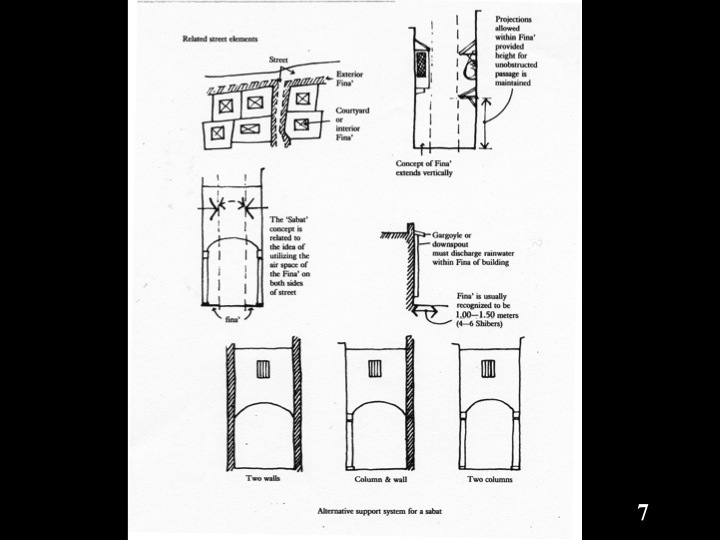 The column had to abut the wall—sometimes one inch is allowed—so that you are proving that you are not taking any additional right of way from the street. So it’s a legal issue; it’s not an aesthetic issue. This is another important concept (Image 8) : The codes usually are proscriptive in nature, rather than being prescriptive. 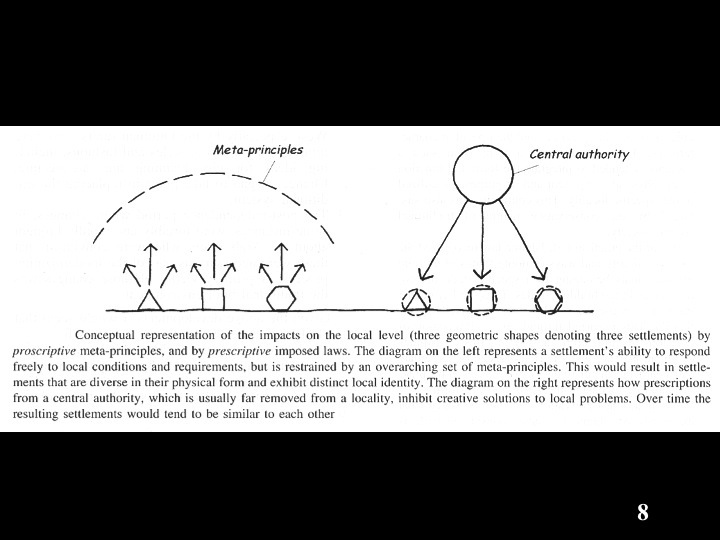 If you have a central authority with specific standards, what that tends to do with time, is that each distinct locality becomes similar to others. Whereas the system shown, on the left of the image, allows each locality to maximize its individuality. An example of this type of code: You are free to design and manipulate your property, provided you do not create damage onto adjacent properties. So you are free to manipulate, provided certain damages are not created. This one, on the right of the image, actually tells you to do something: Thou shalt do X, Y, and Z. For example, you must set back by X number of feet from the front, or Y number of feet from the sides. So it has very different implications on the built environment. 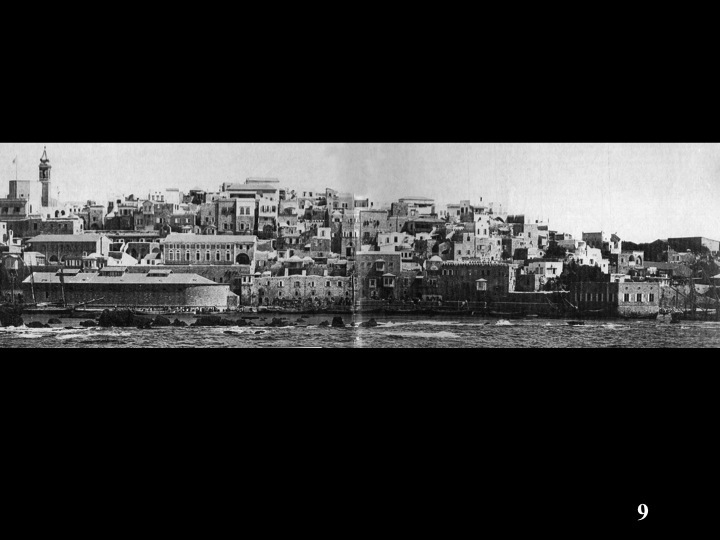 This (Image 9) is a photograph of the town of Jaffa—which is in Israel today—in the early 1940s. The reason I am showing it is because Ascalon’s built form, as seen from the sea during the 6th century, might have looked like this. Ascalon at that time had multi-story buildings: four, five, sometimes six stories, and Jaffa seems to have—in the 1940s, anyway—this kind of pattern, and it also slopes down toward the sea like Ascalon. By the way, Ascalon doesn’t exist anymore; it’s just an archaeological site now. 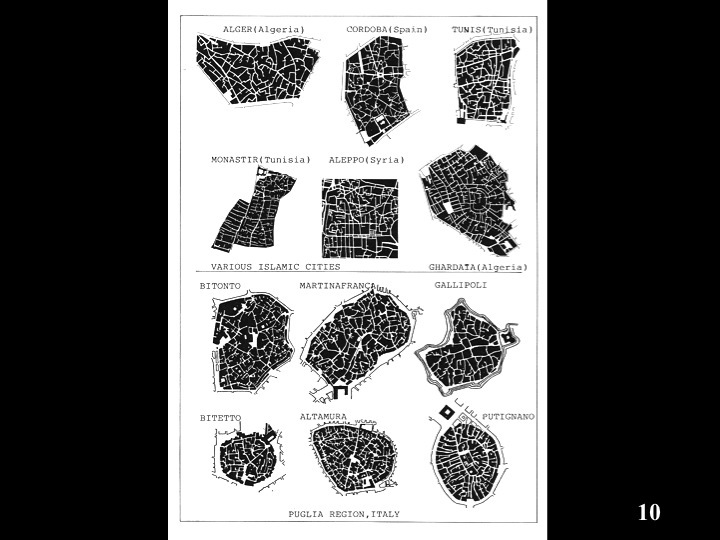 This (Image 10) is a drawing from an Italian study done in the early ‘80s, showing the influence of the prevalent pattern of urban tissue in Islamic cities on these towns in Italy. These six examples–not to the same scale–are from the Puglia region of southeast Italy. These still exist today; you can see the pattern is very similar. The question of these cul-de-sacs and pattern of streets is a whole other subject, which requires another lecture as to why these cities tended to have this type of street pattern. 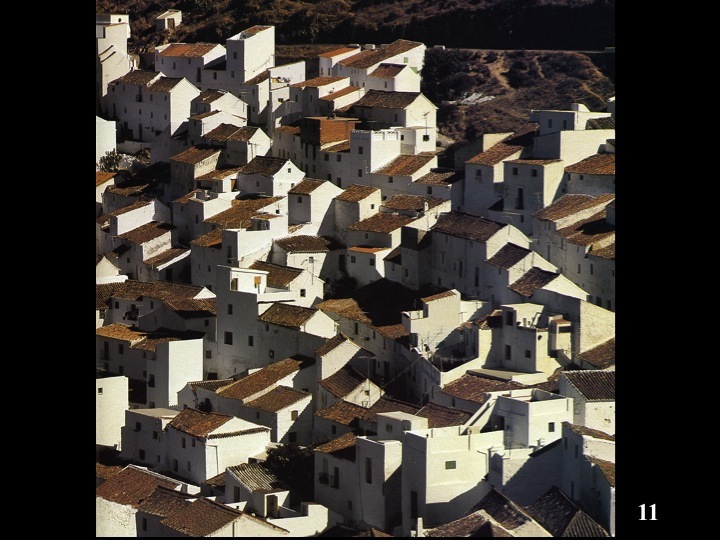 This (Image 11) is an example from the province of Andalucia in southern Spain, of the town called Casares. The reason I am showing this example is because the rules and codes, which allow abutting, and the whole question of eliminating damages from one person to another, and so forth, was actually operational in creating this town. As I said, a lot of the Spanish codes, written pre and post-1500s, continue the same tradition found in Ibn al-Imam’s treatise from the 10th century. 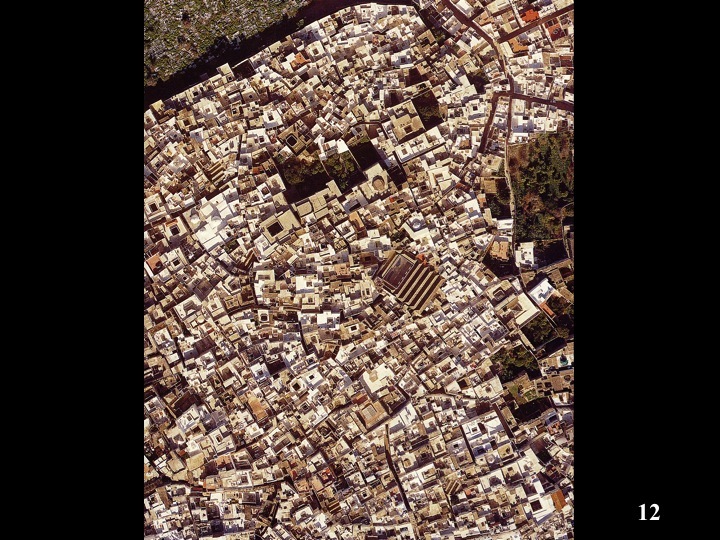 This (Image 12) is an aerial photo taken in 2000, of the city of Tetuan, in northern Morocco. 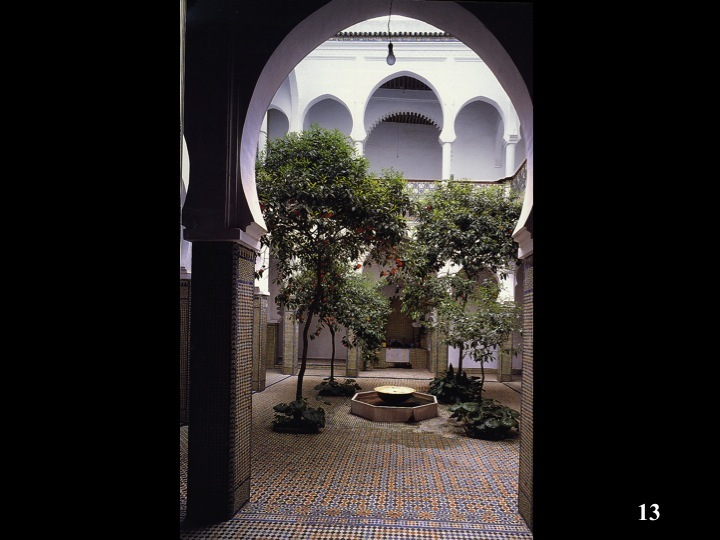 You can see the pattern, the typical pattern of Islamic cities, based on the typology and system of courtyards. But of course, a number of cities in the Muslim world did not follow this pattern. The morphology is different but the code system was very similar. In other words, the code system is responsive to different morphologies, because it’s very flexible, understandable, and very easily implementable. 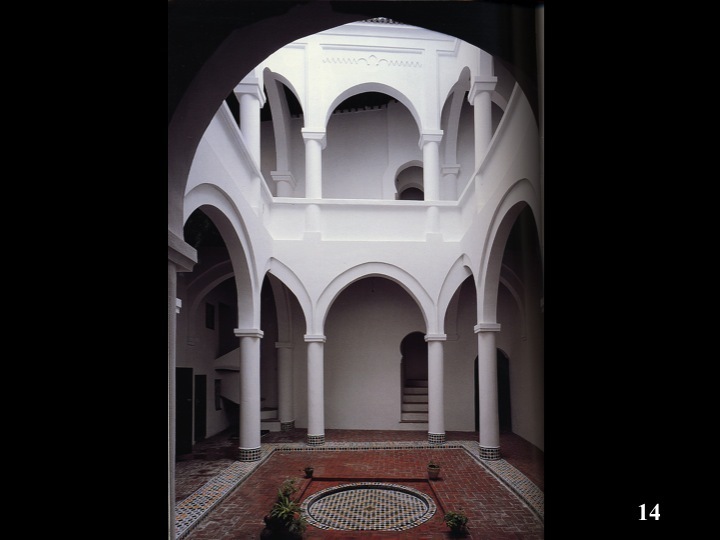 However, this is the predominant pattern found in the Islamic world, as you see it in Tetuan: the courtyard typology and the pattern of streets, cul-de-sacs, and so forth. The reason for the different axis of the mosque is because it has to face Makkah, and, therefore, the axis of the building had to change. I’ll show you a couple of courtyards. One is this one (pointed to aerial photo), which is a nice and big house here; and the other one is just off the aerial photograph. This (Image 13) is Dar Erzini, the first courtyard I pointed out in the aerial photo. You can see these houses are two stories, sometimes two-and-a-half stories. 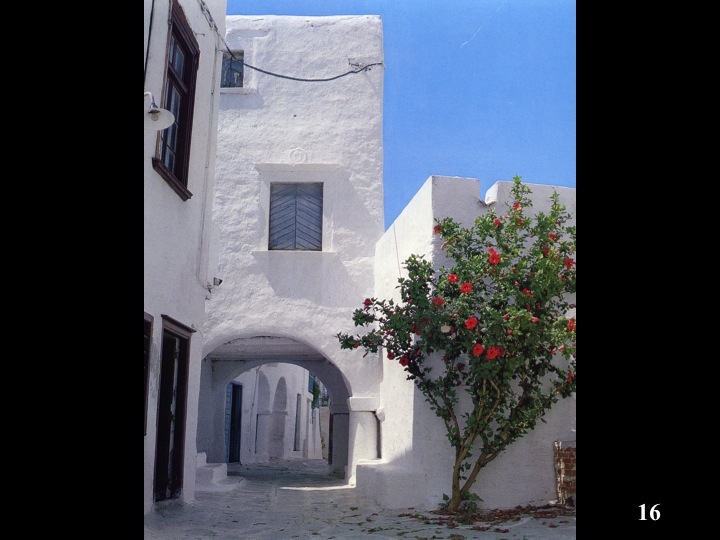 And this is another one (Image 14) Dar Naqsis, renovated recently in 1996. You can see the nice renovation. Look at the way the corners are treated: very interesting junctions you have here. Both houses were built in the 18th century. The walls going this way—were they originally there? Yes. Basically, what they did was renovate the bad condition of the walls, the columns, and so forth. 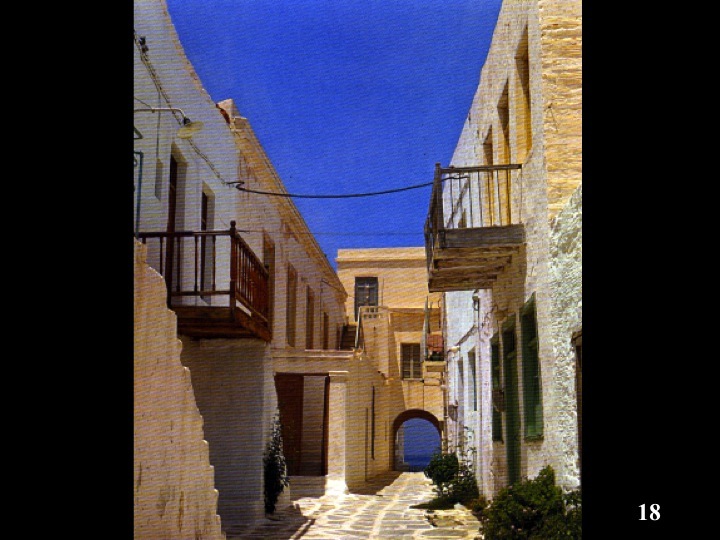 Now, we go to the island of Paros, in Greece (Image 15). Here, we find the concept of the fina—the one I told you about—that invisible area next to the property line. Remember, people build right next to the property line. No setbacks. But, they had the fina—which people could use. 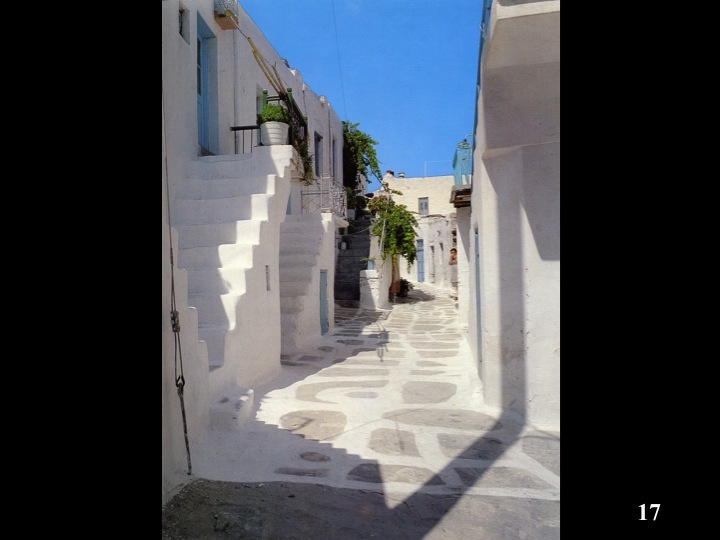 In this example from Paros, the minimum width of the street was maintained. But the use of the fina itself was up to the owners of whether to use it fully or not. The owner of the structure on the left has a bench here; there are stairs to the upper level; you can see the projection on the right is also within the fina. And then there is a sabat, the room bridging the street. In this case the sabat might belong to the owners of the structure on the left. This is another picture from Paros (Image 16). You can see the sabat sitting on the columns on the right. That means the owner of this sabat is the owner of the house on the left. The concept of the fina allows some shrubbery, vegetation, and trees, as long as it does not obstruct the right of way. And that creates a pleasant situation here. Here is another one from Paros ( Image 17) . I love Paros; I’ve been there; it’s a great little town. And there is the fina in operation on the left side of the street by using the upper levels and maintaining the minimum width of the street. Hardly any usage of the fina is seen on the right side. Streets usually were cleaned by people from both sides, up to more or less a middle line; they were responsible for maintaining and cleaning it on a shared basis. And this last photograph (Image 18) shows the upper projection on the right within the fina, including the shrubbery below, and, of course, the more intensive use of stairs and balcony on the left side of the street. The sabat, with an indication, I think, in this photograph, of the columns being on the right, which means this sabat belongs to the house on the left. I made this presentation short because Bill told me to keep it to around 30 minutes. I was curious about the nature of the sabats and their overall depth—how wide [along the axis of the street] they tended to be or were there any regulations governing that. Not really—when you say “wide,” you mean along the axis of the street, right? Yes. Sometimes they are just a room width. Sometimes there are multiple rooms, creating a condition of a covered tunnel. This is particularly evident in the more dense, urban parts of cities, especially large cities, like Tunis, rather than in small towns, like Paros. So yes, the sabat can create this tunnel effect—if the conditions of ownership on both sides allow the sabats to continue along the axis of the street. Right. Well, the Greek experience—with Julian of Ascalon, you see, in fact, his codes, in general composition, are very much proscriptive, but, because he wrote them for the region of Palestine, he added a lot of actual standards in the code, based on his experience in that region. Those standards were to be followed, presumably, to make it easier to apply. Also remember: During the early Byzantine period, particularly to about 900 A.D., the emperors and their legal apparatus tended to be very central in their attitude. And they liked to prescribe. In fact during emperor Zeno’s reign in the late 5th century, he prescribed certain things about buildings, before Julian’s time, which later, the emperor Justinian—the famous emperor Justinian I, who compiled all the Roman laws into the Corpus Juris Civilis, a huge compilation— imposed Zeno’s codes on the whole empire. There is evidence that people were very agitated by that, because of the prescriptive nature of Zeno’s codes. Now Armenopoulos, from Thessaloniki, when he compiled the Hexabiblos kept a lot of Julian’s prescriptive standards. Remember, he was a lawyer, he was not an architect or a building specialist, so he didn’t want to tamper with those standards. In fact, certain evidence shows that in Constantinople, during the emperor Leo VI’s reign, a number of Julian’s standards were ignored, because they could not be applied to the conditions in Constantinople. But most importantly, in Greek history, especially post 1500, during the Ottoman period and up to Greek independence, the customary laws of each region flourished because the Ottoman authorities did not interfere at that level, and left such matters and decisions to local councils of elders. And so in each region very open-ended, proscriptive codes for the particular locality evolved. And that is why, when you travel in Greece and these islands, you will find broad similarities, but in fact, each region has its own characteristics. It’s a very interesting point, and I hope a forthcoming study of mine will address that period: 1500 to about 1900, to show, in fact, that a lot of local identity flourished. Also, there’s another point: The Greek church tended to have great respect for the period of compilation of laws by Justinian I; as a result, they tended to respect that and implement it, if possible—which included Julian’s stipulations as they were recorded in the Hexabiblos. Stef, I think what we’re confusing here is [unintelligible] and artifact. As a finite artifact. That they actually create two comprehensive worlds. And the fact that [unintelligible]. People say, “Your codes are too tough.” And I say, “All we do is fold in humans. If they’re too perfect, just bring the humans in.” Imperfection takes care of itself, and it’s free. [Unintelligible] . . . architects who build a huge number of buildings all by themselves . . . and I think that that is what’s truly incredible . . . [unintelligible] . . . I just wanted to elaborate on this very important point. Remember, in most towns, during centuries of experience, the developer, as we understand him today, did not exist. The process was direct, that is the owner of a plot hired a master builder and they negotiated how the construction would go. At this time, we have the developer, who assembles a number of lots, designs and build the structures based on a number of model prototypes. That is precisely why you need a code. Yes, yes, I’m talking about the role and responsibility of the developer, and his techniques for generating housing, which can change, instead of creating this “rubber stamp” type of environment, which is terrible. What I found so interesting about your presentation of the basis for those codes is they were all about assigning rights and privileges among individuals, which was, in that context, there was a much narrower range of building technologies, a much more limited range of transportation technologies, so simply defining the rights of neighbors relative to one another was sufficient, in many cases, to build those beautiful places. Well, now, the rate at which the transportation technology has evolved, and the rate at which building technology has evolved, has greatly exceeded our ability to adapt to it—I mean, we can’t evolve as fast as that stuff is evolving. We can’t. So the codes, now, have to control the [unintelligible] with a much wider range of possibilities that the transportation and building technologies have created, to once again fit it to us—because we can’t change. I thought about that, and in my view, if you consider our contemporary system, using your term, a [unintelligible] system, which has a certain technical sophistication to it, including the infrastructure, water, electricity—I think the public sector is the sector to do that. But within the islands that are created, then it’s possible to have a different system than what we have today, whereby the role of the developer can change, at least in terms of his responsibilities and methods of intervention in the built environment. And the code system can be more open-ended, within those islands, and proscriptive in nature. This way you can get a lot of variety occurring, even within the same city. But the question of the public realm, because of its technicality and so on, you need a more central authority to build and manage it. Images 1 and 2: The Penguin Atlas of Medieval History. By Colin McEvedy, Penguin Books, Middlesex, U.K., 1961. Image 3: Courtesy Bibliotheque Publique et Universitaire, Geneva. Image 4: Courtesy Bibliotheque Nationale D’Algerie, Alger. Images 5 and 6: Copyright owner: Besim S. Hakim. Image 7: Arabic-Islamic Cities: Building and Planning Principles. By Besim S. Hakim, KPI, London, 1986, 2nd Edition 1988, from page 28. Image 8: “Reviving the Rule System”, Cities, vol. 18, no. 2, April 2001, pp. 87-92, from page 92. Copyright owner: Besim S. Hakim. Image 9: Copyright owner: Institute for Palestine Studies, Washington, D.C. Image 10: Vicoli e Cortili: tradizione islamica e urbanistica popolare in sicilia. 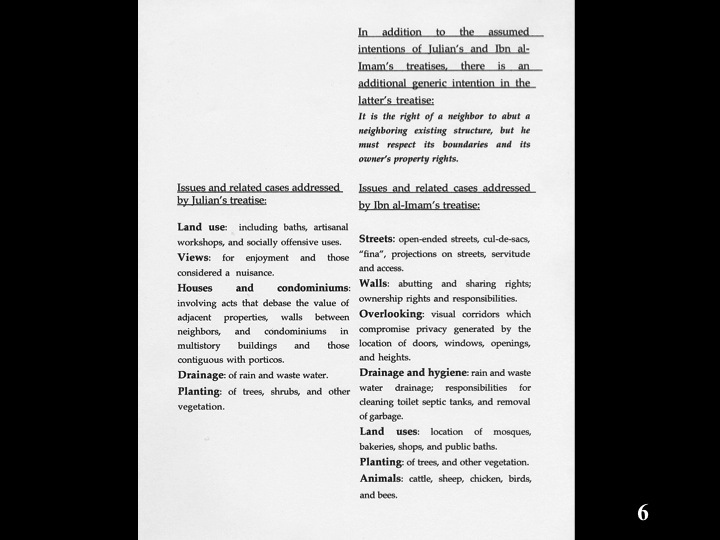 Coordinated by Enrico Guidoni, Edizioni Giada, Palermo, 1984, from page 13. Copyright owner: Linee d’Arte Giada, Palermo. Image 11: Iberian Villages: Portugal and Spain. By Norman F. Carver, Jr., Documan Press, Kalamazoo, Michigan, 1981, from page 157. Copyright owner: Norman F. Carver, Jr. Images 12, 13, 14: Le Medina de Tetuan: Guia de Arquitectura. Ciudad de Tetuan and Junta de Andalucia, Tetuan–Sevilla, 2001. Copyright owners: Junta de Andalucia–Sevilla, and Consejo Municipal de Tetuan Sidi Mandir–Tetuan. 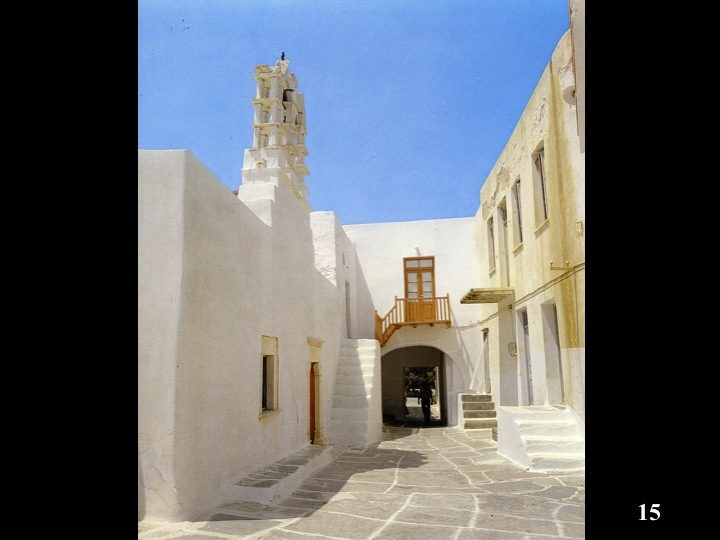 Images 15,16,17,18: Paros: Greek Traditional Architecture series. By Maro Philippas-Apostolou, Melissa Publishing House, Athens, 1984. Copyright owner: Melissa Publishing House, Athens.